A number of years ago, after his wife and daughters were slaughtered during a period of civil unrest in his African homeland, Wilson (Cake-Baly Marcelo) escaped to Hungary. The 50-something widower chose to seek political asylum in Budapest instead of continuing on to Western Europe like most of his fellow refugees. He soon found a nice apartment and steady work as a supermarket security guard and liked living in the city. However, the only thing standing in the way of his staying in Hungary permanently was that he repeatedly flunked the country’s tough citizenship test. His boss Eva (Tunde Szalontay) did not want to lose her reliable “Employee of the Year,” and suggested that Wilson take history and language lessons from her sister Mari (Agnes Mahr), a teacher. However, sparks flew between Wilson and Mari, who was in an unhappy marriage. Their tutorial sessions soon turned into a whirlwind romance that included dancing, swimming, and dining together. Mari finally abandons her husband (Peter Barbinek) and son (Peter Sandor) and moves into Wilson’s flat. However, she found that he has a much younger woman with an infant living with him. He explains that his relationship with Shirin (Arghavan Shekari), an Iranian refugee, is purely platonic, and that her newborn baby isn’t Wilson’s. Nevertheless, Mari isn’t comfortable with such an unorthodox arrangement. 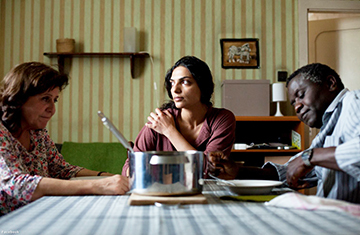 The Citizen is a poignant, cross-cultural love story directed by Roland Vranik (Transmission). What makes the film unique is the advanced age of the protagonists, since most romance dramas usually involve considerably younger couples. Excellent (****). Unrated. In Hungarian with subtitles. Running time: 109 minutes. Production Studio: Popfilm. Distributor: ArtMattan Productions.